Who’s Responsible For Paying A Contractor’s Overhead And Profit? 28 AprWho’s Responsible For Paying A Contractor’s Overhead And Profit? Imagine your insurance company has finally approved your claim after suffering a loss to your property. You reach out to the contractors and schedule a time to start work; after all, it’s been far too long since your house has been in any sort of acceptable condition. The contractors require payment for the work, so you reach out to your insurance company for the money to cover their overhead and profit. And your request is denied. Seems unfair, doesn’t it? Well, it is. And, thanks to the hard work of the attorneys at Wheeler, DiUlio, & Barnabei, it is now also forbidden. What Is Overhead And Profit – And When Should It Be Paid? 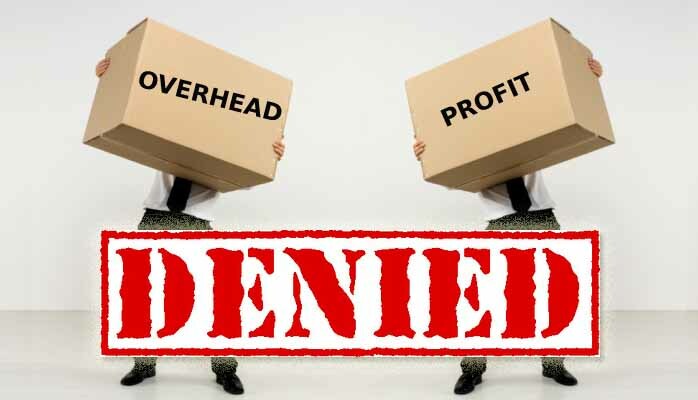 Simply put, “overhead and profit” is the financial compensation – over direct costs – which any contractor, painter, or tradesman will charge so that they can earn an income. Time of payment varies depending on the contractor’s own policies. However, many contractors will require a deposit be paid up front, and some will ask to be paid in full for the work before they even begin. Time of payment is established by the contractor’s business policies and therefore is typically not up for negotiation. Where Did The Problems Begin? Truck Insurance Exchange (part of the Farmers Insurance Group) was refusing to pay for overhead and profit up-front. They claimed that the contract of insurance said that they didn’t have to pay the cost until it was incurred. That is, they refused to pay overhead and profit until the work is completed and YOU have already paid for it. This left the policy holder in charge of coming up with the money to pay any costs for contractors etc., which is an issue if you don’t have that kind of money just sitting around – and many people don’t. According to Truck Insurance, even if your claim was approved and they promised to pay for your repairs, if the contractor required payment up-front and you could not give them the money out of pocket, the repairs to your home would never be completed. Wheeler, DiUlio, & Barnabei To The Rescue! Not only was Truck Insurance (and, by default, Farmers Insurance) violating their clients’ trust, but they were also in breach of contract. Wheeler, DiUlio, & Barnabei set out to prove that their practices were unconscionable and illegal. Based on the results of this previous case, the Pennsylvania Court of Common Pleas agreed that Truck Insurance was required to incorporate overhead and profit in the Actual Cash Value settlement of a covered loss. Not only did we win this case on behalf of our client, but the matter has now been filed as a Class Action lawsuit. If certified, this case affects all settlements between policy holders and Truck Insurance nationwide who have not received overhead and profit payouts along with their settlements since July, 2014. Additionally, we will be pursuing a bad faith claim on the part of Truck Insurance, which could result in punitive damages. At Wheeler, DiUlio, & Barnabei, we’re here to represent your rights against big businesses whose only concern is making more money. If you feel your insurance company is withholding payouts they are required to make, or if you are a contractor or public adjuster whose fees are being denied by an insurance company, give us a call. Click here to contact an attorney at Wheeler, DiUlio, & Barnabei.